Dr. Lee earned his bachelor degree at Johns Hopkins University and received his MD from Cornell University where he graduated with Honors in Research and was a Howard Hughes Scholar. He completed his ophthalmology residency at Cornell and then went to Harvard Medical School as a Heed Fellow where he studied retinal stem cells and the role they play in cancer. He completed his retina fellowship at Massachusetts Eye and Ear Infirmary before returning to Cornell where he held the St Giles Endowed Chair in Pediatric Retinal Diseases until being recruited to Children’s Hospital Los Angeles. 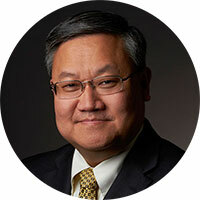 Since his arrival, Dr. Lee has developed the Retina Institute into a world class center and in 2011 was promoted to Director of the Vision Center which has eight full time faculty devoted to all aspects of childhood blindness. Dr. Lee has made several advances in our understanding of pediatric retinal disease and has recruited a team of physicians and basic scientists to develop new treatments for conditions such as retinoblastoma and retinopathy of prematurity. In addition to developing a robust research program, he has helped create an innovative education platform to teach doctors in developing countries remotely over the Internet. In 2010 he established a program in conjunction with the Armenian Eye Care Project, which deployed digital retinal cameras to the capital city of Yerevan that allowed the US based experts to supervise Armenian doctors during their weekly rounding on babies with a blinding disease called Retinopathy of Prematurity (ROP). More recently he has helped establish a neonatal nursing educational program to assist the nurses who care for these children. It is his long-term goal to create an open online education platform that can be used to teach doctors and healthcare workers in developing countries and provide them with a level of expertise comparable to that of the United States.